In the face of this uncertainty, a prevalent view is that a cautious approach is warranted: if a policymaker is unsure what a tool does she should use it gingerly. Indeed, this is a classic result from the literature on optimal stabilisation policy under uncertainty as shown in Brainard’s 1967 article. The intuition for this is simply that additional uncertainty over what a policy tool does is perceived to introduce additional volatility to the economy when it is used, which is undesirable from the policymaker’s perspective. However, an important feature of Brainard’s analysis is that the form of uncertainty matters. Brainard’s results are sometimes misleadingly cited as a general rule that a policymaker should do less in the face of uncertainty. The second conclusion from this form of model is that being unsure over the state of the economy (for example, the inherent stability of the financial system) should not alter policymakers’ behaviour. Charts 1 and 2 illustrate the potential magnitude of these different sources of uncertainty faced by the Bank of England’s FPC. 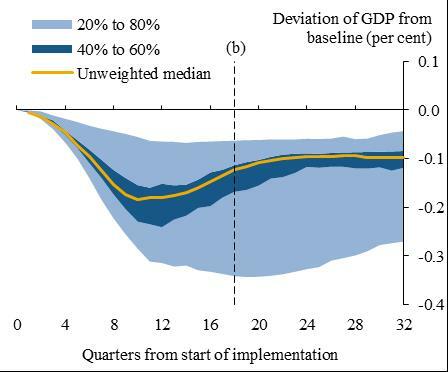 The panel on the left presents the range of estimates for the impact of a change in the counter-cyclical capital buffer (CCB) on GDP, as presented by Macroeconomic Assessment Group at the Bank International Settlements (BIS), with the error bands capturing uncertainty over the impact of the policy instrument. The second chart presents a swathe of measures of banking system vulnerabilities using UK bank balance sheet data (drawn from the FPC core indicator set for the CCB). The indicators frequently present mixed messages and therefore the error bands in the left panel capture uncertainty over the state of the world. Taking Brainard’s result at face value implies that the wider the error bands in the left panel, the less the FPC should use the CCB. However, the error bands in right panel should be less of a concern, and policy should be based on the mean value. Notes: Source Macroeconomic Assessment Group (2010). Distributions are computed across all 89 cases contributed to the macroeconomic assessment group that made use of standard policy forecasting and simulation models, excluding those designed to measure the impact of international spillovers. The shaded areas indicate the range between the 20th and 80th percentile. Notes: The chart shows the UK FPC’s core indicators for the UK banking system (see FPC Core Indicators), the indicators are normalised by deducting their 1987-2014 mean and dividing through by the standard deviation. We present the mean of the indicators and a shaded area denoting the min-max range. In a recently published working paper (Staff Working Paper 584: Macroprudential policy under uncertainty) we take Brainard’s result as a starting point and ask the question: is the uncertainty faced by the macroprudential policymakers sufficient to justify a cautious stance to macroprudential policy? We argue that there are several types of uncertainty and multiple channels through which uncertainty can affect policy making. The result that policy should be more cautious in the presence of uncertainty does not hold in general, particularly for specific examples that are relevant to macroprudential policy. 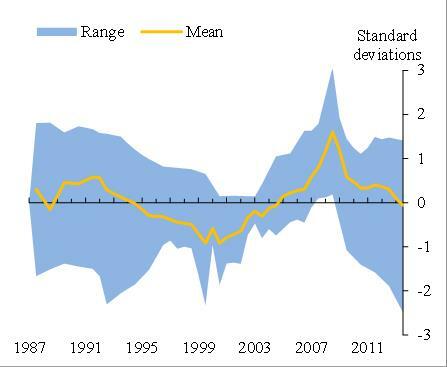 Macroprudential policy is concerned with rare events, the probability of which is difficult to quantify. There is an unescapable need for policymakers to make judgements about the future that cannot be backed by statistical analysis. This sort of unquantifiable uncertainty is sometimes referred to as fundamental or Knightian uncertainty. This form of uncertainty is troublesome for macroprudential policy given the innovation and increasing complexity of the financial system which makes risks difficult to quantify. Also, the objective of the macroprudential policy is often defined in terms of resilience, suggesting a focus upon rare events whose likelihood is hard to judge. In such a situation, the policymaker may wish to behave in a robust fashion, preparing for the worst case scenario. This approach favours policies that avoid large losses across scenarios regardless of how likely any given scenario is. We show that this behaviour can lead to more active policy in the face of uncertainty. The intuition for this lies with the idea that more policy action is required if the most severe scenario occurs and the higher the fundamental uncertainty, the more severe is the worst case. The principle of calibrating policy to prepare for severe outcomes is already embodied within the UK macroprudential framework via stress testing. Stress tests by definition provide a sense of economic outcomes if an extreme scenario emerges. However, behaving in a robust fashion can also mean placing particular attention upon models or indicators that are signalling financial stability risks. For example, in Chart 2 there is a swathe of potential indicators of risks to bank balance sheets: a robust policymaking strategy would be to focus on the upper end of the range, as that is the worst case model, rather than the mid-point of the swathe. Macroprudential policy may have asymmetric objectives. There is good reason to think macroprudential policymakers should care more about a very unstable financial system than one that is somehow “too stable”. Financial crises are exceptionally costly both for the financial system, the wider economy and the public. The costs of missed downside risks may be much larger than benefits of erring towards looser policy. If a policymaker is more worried about financial instability, then increased uncertainty about the level of risk means policymakers should buy insurance against the system being less stable than they think by tightening policy. The cost of this is a tight policy choice in situations when the financial system is stable. A similar intuition emerges for increased uncertainty over the effectiveness of policy: if policymakers are more worried about downside risks, they should insure themselves against their tools being relatively ineffective when needed, by setting tighter policy. Macroprudential policymakers need to learn about how their tools work. A natural way to respond to uncertainty over a policy instrument is to attempt to learn about it. Evidence from other countries, natural experiments or calibrated theoretical models can fill this gap. But this is not a perfect substitute for using the instrument. Uncertainty about what policy does today provides an incentive to act in order to learn, thereby reducing future uncertainty. The immediate practical issue with using a tool to learn is one of communication and political sensitivity. Policymakers would probably struggle to articulate to banks that they were forcing them to raise more capital in order to determine the economic consequences. Treating the economy as a lab rat also runs counter to the policy objectives. However, it is unnecessary to do policy that is harmful in order to learn. The learning mechanism provides an argument to suggest that there are benefits from not being too cautious, not that policy should be set with wild abandon. The private sector is also uncertain about why macroprudential policymakers are acting. It is not only macroprudential policymakers that face uncertainty. The public are also uncertain about risks to financial stability, the impact of macroprudential policy, and how policymakers will behave. Furthermore, the policymaker knows more than the public through access to confidential data, including the results of stress tests. A macroprudential policymaker needs to consider how policy acts as a signal about the risks to the financial system. We show that greater uncertainty over why policy is being changed requires more active policy in response to financial stability risks. If the public is unable to tell whether policy is changed due to risks to financial stability or a general aversion to crises, the strength of the signal in the policy change is diminished. An example of this would be if banks did not know if a high CCB rate was because of a specific financial stability risk or due to a high policy preference for avoiding a crisis. The diminished signalling channel implies that individuals pay less attention to tighter policy and do not believe that it signals heightened risks. Policy is therefore less of a check on private sector risk taking and so following a shock to financial stability, policy will have to react more aggressively to achieve the same outcome. The key policy implication from all this is that policymakers should not sit on their hands and use uncertainty as an excuse for not acting on financial stability risks. These risks are hard to measure (or unobservable) and actions to address them may have short-term costs making it difficult for policymakers to resist the temptation not to act. However, the lags associated with macroprudential policy instruments, both in terms of implementation and transmission, mean that there is the potential for policymakers to move too late ahead of crises. And our work shows that uncertainty is no justification for not acting earlier. Angus Foulis and Saleem Bahaj work in the Bank’s FSSR-MSSD Division. Next Post From Berlin to Basel: what can 1930s Germany teach us about banking regulation? Now we see greater risks and potential for market instability and collapse due to the tools used to put a floor under the market and create bubbles in equities, commodities and debt. Suggest the Central Banks should have allowed the Markets to cleanse themselves and then build on a solid base, using their tools, vs weak/quicksand base that continues to require more and more QE from Central Banks and zero interest rates. These MKTS are more dangerous now than 2008 and Central Banks have played a role in this, with their ill-advised use of tools. Tools are good if used correctly and at the right time.